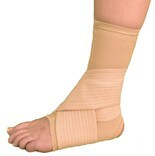 Protect your ankle from sprains and strains by wearing a brace for sports. Most sports involve a lot of jumping and running which can result in a rolled ankle. We offer a wide variety of support from mild, moderate to maximum protection. Choose from different types of braces: elastic, neoprene, latex-free, rigid, medical and more. If you’ve already suffered an injury, get the extra support you need as you recover. Our products are designed with functional recovery in mind meaning you can keep moving while wearing a comfortable brace to help support your ligaments while you heal. Buy Direct from US Manufacturer Our 4 inch cryotherapy non-toxic bags are microwavable for your heat therapy and remain pliable when frozen. This pliability allows the ezy Gel bag to conform to your Read more..
Cryotherapy Ankle Wrap - 1 Pocket This blue foam, Velcro® compatible wrap, with a terrycloth lined pocket will become an integral part of your ankle sprain treatment. The non-toxic ezy Gel bags provi Read more..
Buy Direct from US Manufacturer Cryotherapy Ankle Wrap - 1 Pocket Grey This Grey Compression, Velcro® compatible wrap, with a lined pocket will become an integral part of your ankle sprain treatment. Read more.. This is our value solution for your cryotherapy therapy needs. 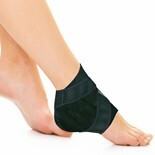 A pocket fabricated into our latex free, cotton blended polyester bandage, holds a non-toxic ezy Gel or ice bag for excellent compressio Read more..
Find an ankle brace to support your ankle and help alleviate pain when you play sports.